ntopng can split and visualize the traffic into virtual interfaces based on a specified criterion. This comes handy, for example, when a single nProbe instance is capturing flows from multiple NetFlow/sFLow exporters. By default, ntopng would aggregate all the exporters traffic together into one tcp://… interface, whereas by enabling the disaggregation by “Probe IP” ntopng will also create as many virtual interfaces as the exporters, for example tcp://…192.168.0.1 and tcp://…192.168.2.20 . Dynamic Interfaces Disaggregation can be enabled from the “Network Interfaces” preference tab. 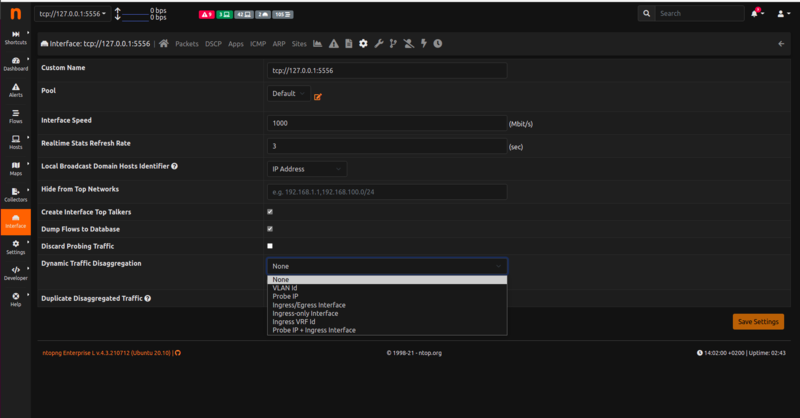 Interface : on ZMQ, create a virtual interface for %INPUT_SNMP and another for %OUTPUT_SNMP. A single flow will be duplicated on two virtual interfaces. Most of them only work in ZMQ mode and require the relevant template field to be added to the nprobe options as explained in the nprobe section.